Granite is by far the most suitable and preferred option for the kitchen countertop. However, granite countertop, due to the continuous usage, becomes dull and loses their shine. 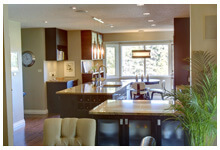 To find granite in Edmonton may not be a tough task, but to maintain it like new can be. Here are some few steps to clean the granite countertop. You can use the regular dishwasher liquid that you use in the kitchen. Pour a few drops of liquid to half a bucket of warm water and work up lather. Take a sponge and soak it in the lather and wipe the surface of the granite using circular motions. Avoid using hard cloth as it might put some fine scratches over the surface. Use normal water to rinse away the lather and wipe it off with a microfiber cloth. Repeat the similar process once a month or once in two months to keep your stone shining like new. Many times while working in the kitchen, we accidentally spill something over granite, causing a stain on the surface. Always clean the stain immediately as the more it will stay on the stone, the deeper it will become. Here are some steps. Use hydrogen peroxide to absorb the liquid. Pour some amount on the spill and don’t rub it. Always read the instructions before using the hydrogen peroxide. If you want to create a paste, you could use more of the quantity to have a mixture like putty. Apply the putty at the stained area and don’t put it anywhere else. The applied layer should be about one fourth of an inch thick and should overlap the stain completely. After the application, cover the area with a plastic film, taping the sides down. Allow the putty to set till it is dry. This can take anywhere from one to two days. When the paste becomes dry, use a wet sponge to wipe the paste. After wiping, cleanse the area with water and allow the surface to dry. If the stain still remains, then you need to repeat the step again till you get the desired results. If the stain still persists, call for professional help to get the stain removed. Granite is very hard natural stone and is scratch resistant. If you find any scratch on the surface, always call for professional help. Always use coasters under the glasses to protect the surface from any possible stains. Avoid the spillage of alcoholic drinks on the surface of granite as they may make it dull. Always use hot pad before placing any hot items over the granite. Resealing helps. Always reseal the granite once in two years to keep its shine intact. If you have matching granite flooring with the countertop, it is advisable that you clean both, using granite cleaner or call for professional help. For daily cleaning, wiping with moist cloth is enough.